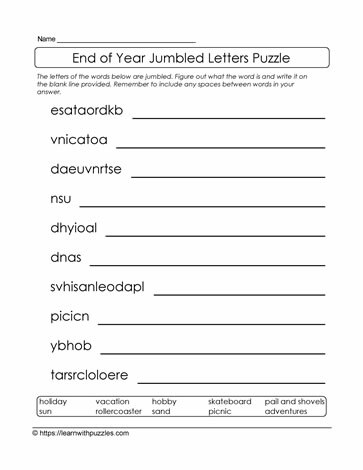 This end of school year jumbled letters puzzle is great fun for kids and educators as the class winds down the school year and moves towards summer vacation. Great fun for kids, because kids love puzzles. Great for educators because kids' brains are still being engaged, vocabulary is still be reviewed, and spelling is still being practised. Fine motor and handwriting skills, as well as hand-eye coordination are also benefits without kids being aware.